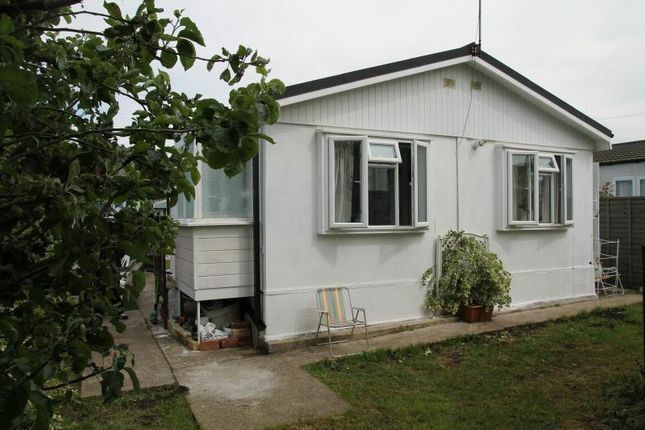 This two bedroom mobile home is offered to the market in well presented condition with two double bedrooms. The property has recently had the roof replaced and also benefits from a combi-boiler. It is accessed from a private pathway and is set back off the road. Access to a large walk-in storage cupboard and doors to remaining rooms. A large airy room, laminate flooring, recessed down lighters, central heating control panel, double aspect UPVC double glazed windows overlooking the side and rear of the property, two radiators, telephone, television and power points. Comprising of a range of eye and base level units, wood effect worktops, laminate flooring, space for appliances - fridge/freezer and washing machine, combi boiler, stainless steel sink and drainer with mixer tap, four ring gas hob and oven, glazed door leading to side of the property, double glazed windows over looking side and rear of the property, space for dining table and chairs, radiator and ample power points. A double bedroom with laminate flooring, side aspect double glazed window, power points, dimmer switch, radiator, recessed lighting. A second double bedroom single radiator, power points and a double glazed window over the side of the property. Recessed lighting & wood effect flooring. A fitted white suite comprising of a low level W.C., pedestal wash hand basin with twin taps, panel enclosed bath, frosted window overlooking the side. The property has a surrounding garden and is panel fence enclosed with tree, shrub and flowerbed borders. The rest is laid to lawn.